Flavia is synonymous with innovation. The compact yet sophisticated brewer can take a unique Freshpack pouch and turn it into a cafe-quality drink. No messy counters to clean or full pots of cold coffee to toss — the single-serve technology ensures a fresh, delicious beverage every time. Whether it’s a premium green tea or a chocolate-infused mocha, the Flavia brew from Cromer Food Service can deliver the best beverages for your location. Each drink is self contained in the small Freshpack, which is only available to corporate customers. The Flavia single cup brewer offers personalized beverages using the integrated touchscreen that includes recipes and user prompts. 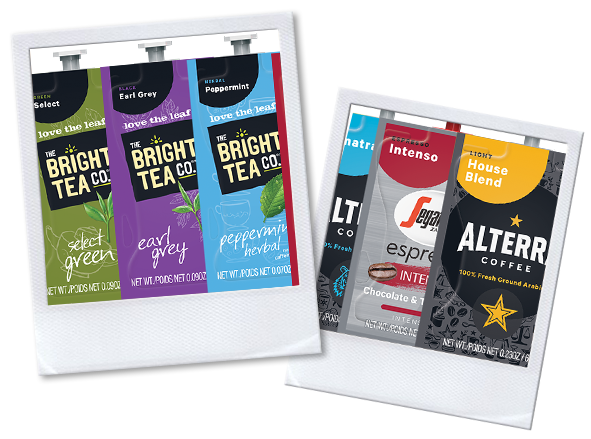 It’s a convenient way to deliver the variety and flavor of a coffee shop right in your break room. As an authorized distributor of this ideal single cup brewing system, we can offer Greenville, Spartanburg and Anderson, South Carolina businesses an exclusive option. Enjoy unique beverages with a modern brewer that ensures optimal water temperature and flavor extraction no matter what drink you choose. Gourmet coffee, espresso, hot teas, all crafted just that way you like with sophisticated brewers and the best tea brands. Awaken your employees and customers to the possibilities with Flavia, available from Cromer Food Service at 800.922.3174 or info@cfsvending.com.